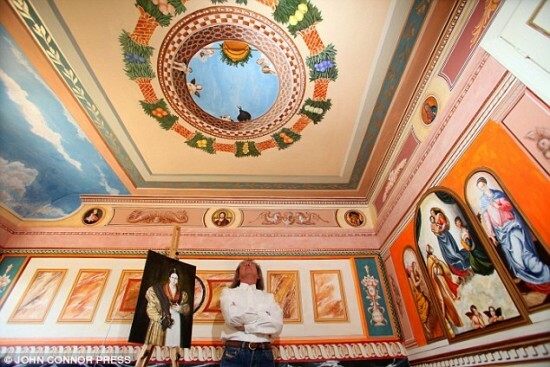 Every inch of his sixties house, on the outskirts of East Sussex, is covered with elaborate paintings inspired by 15th century Renaissance works, but made sure he added his own personal touch. For example, his portrait of Jesus looks exactly like comedian Russel Bran, and it’s not by coincidence. Burns saw his photo in a newspaper and though he looked exactly like the Messiah. In Correggio’s fresco, which he used for his staircase, he painted his own eagle bevause he thought the original looked more like a turkey than a bird of prey. 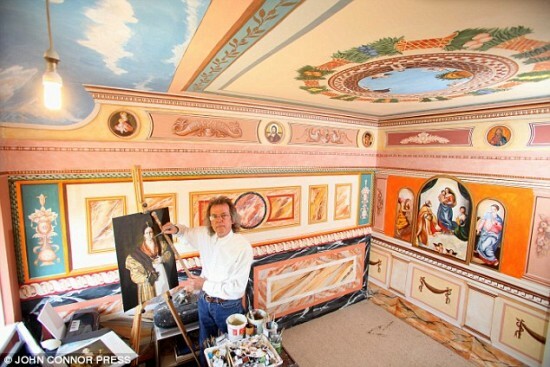 The retired decorator admits his recreations are not as good as the original Renaissance works, but he is definitely pleased with what he has managed to achieve. And his not the only one; four years ago, when his stylish interior was only half finished, his work caught the eye of a billionaire who hired him to redo the ceiling of a crumbling ballroom. This job made him feel like he was really walking in the footsteps of artists like Rafael, who started out as talented decorators.